Beware of the I.M.F. Pack of Lies! 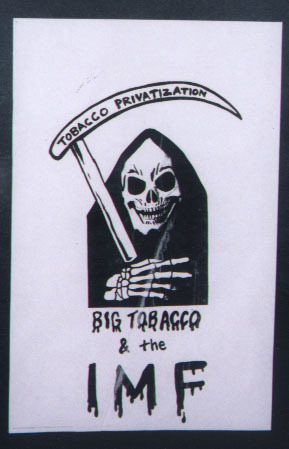 The Truth: Tobacco Privatization Kills! I.M.F PACK OF LIES ! 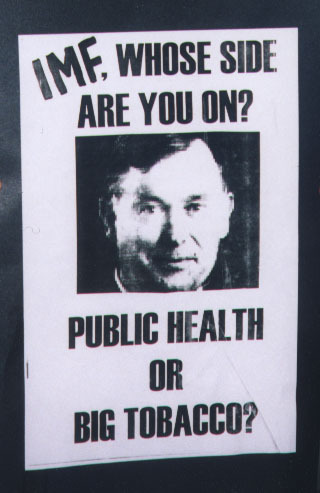 The Truth: TOBACCO PRIVATIZATION KILLS ! The global Merchants of Death, a.k.a Philip Morris British American Tobacco, have a good friend in the International Monetary Fund. The IMF doesn't think twice about forcing low-income nations to sell their inefficient tobacco monopolies to multinational tobacco corporations that are true masters of killing for profit. 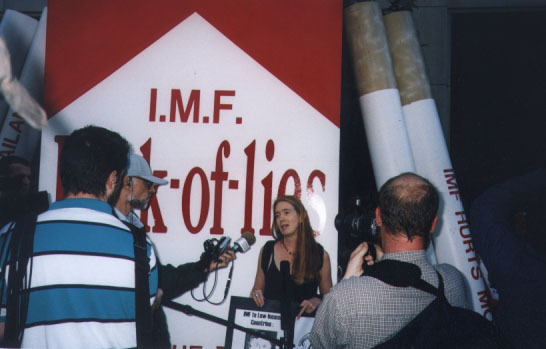 On September 23, 2002, Essential Action released a report detailing how the IMF pushes policies that undermine public health and help Big Tobacco. We also held a demonstration in front of the IMF headquarters to expose the IMF's "pack of lies"! 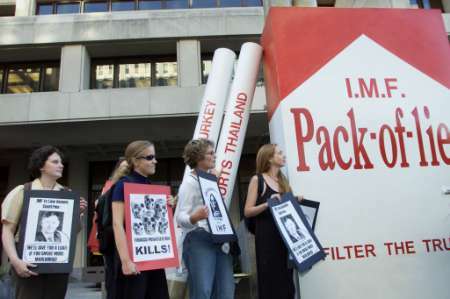 In particular, Essential Action's investigation found that the IMF has pushed for tobacco privatization in: Bulgaria, Korea, Mali, Moldova, Thailand, Turkey. Essential Action also found that the IMF has supported excise tax or tariff reductions in: Djibouti, The Gambia, Macedonia, Peru, and Uganda. 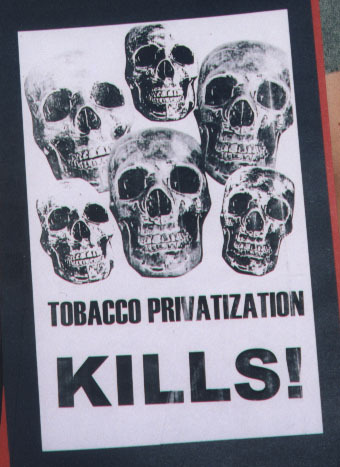 "TOBACCO PRIVATIZATION KILLS" DEMO A SUCCESS! Our gigantic, 10-foot high "IMF Pack of Lies" prop succeeded in garnering tremendous media coverage. 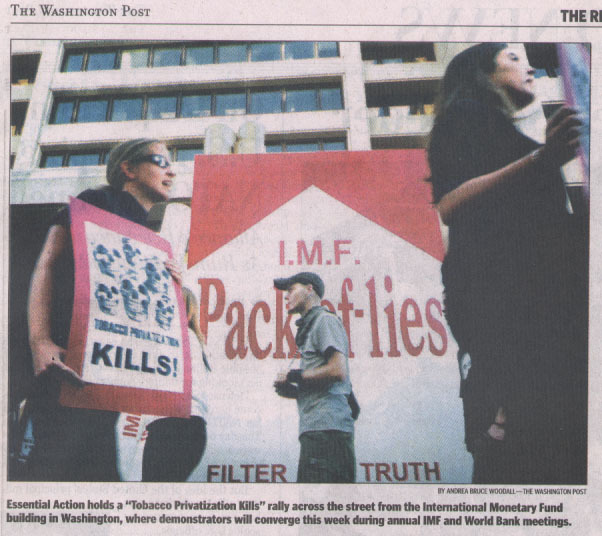 The prop featured four huge removable cigarettes labelled "IMF hurts Turkey," "IMF hurts Moldova," "IMF hurts Thailand" and "IMF hurts Mali" -- all countries where the IMF has aggressively pushed for tobacco privatization. 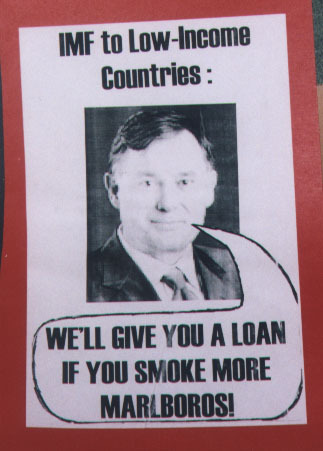 "IMF to low-income countries: We'll give you a loan if you smoke more Marlboros"